A recently released staff report from the Federal Communications Commission claims AT&T and T-Mobile failed to prove that their proposed merger was in the public interest, even noting that the carriers had submitted inaccurate information to the commission. AT&T and T-Mobile parent company Deutsche Telekom announced in March a $39 billion deal that would see the No. 2 and No. 4 U.S. carriers merge. The deal was quickly met with regulatory opposition, with the Department of Justice going so far as to sue to block the acquisition in August. Last week, the FCC weighed in when Chairman Julius Genachowski called for an administrative hearing to address the merger. Genachowski also expressed his belief that the deal was against the public interest. AT&T and T-Mobile responded by withdrawing their application with the FCC, ostensibly to focus on the DoJ lawsuit. The agency on Tuesday formally accepted the applicants' withdrawal and released the findings of its staff analysis. The commission's staff report found "significant competitive concerns" surrounding the transaction and raised "substantial and material" questions about the potential effects on roaming, wholesale, and resale services, backhaul and handsets. The staff also disagreed with the applicants' claim that the merger would lead to lower prices while also creating more jobs. After a thorough analysis of the potential effects of the merger, the commission's staff maintained that the applicants "have failed to carry their burden of proving that the proposed transaction, on balance, will serve the public interest." 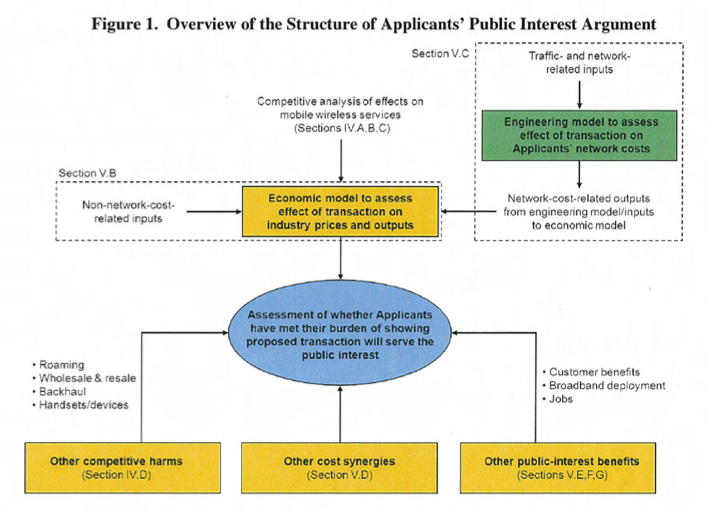 "Staff further finds that the bulk of the Applicants' proffered benefits are inadequately supported by the data supplied, achievable through means other than the elimination of a competitor, or otherwise not cognizable under the Commission's public interest standard," the report concluded. FCC commissioners spoke out in support of the staff's findings. Commissioner Mignon L. Clyburn said in a statement on Tuesday that the agency released the report in order to "promote federal agency transparency" and to allow outside parties, which have spent "considerable time and resources" responding to information requests, to see the completed analysis. She added that the report could also be helpful to AT&T and T-Mobile as they reevaluate their application. The carriers have said they are continuing to pursue" the acquisition and plan to resubmit an application to the FCC. "Despite repeated claims that this transaction will be a significant job creator, the staff, after thorough review, could make no such finding," Commissioner Michael J. Copps wrote in a statement regarding the report. Copps also voiced concerns that the acquisition of T-Mobile would eliminate a carrier targeting "budget-conscious consumers," potentially pricing out lower-income customers. According to him, AT&T had provided "no guarantee that the new entity will continue to serve this population." The commissioner went on to discourage AT&T and T-Mobile from resubmitting its application. "I would hope the withdrawal is not a strategic gambit along the road to resubmission of this or a similar application in the months ahead," he said. However, the Associated Press reports that AT&T's top lobbyist, Jim Cicconi, was troubled by the FCC's decision to release the report. "This report is not an order of the FCC and has never been voted on. It is simply a staff draft that raises questions of fact that were to be addressed in an administrative hearing, a hearing which will not now take place," he said. "It has no force or effect under law, which raises questions as to why the FCC would choose to release it." Shortly after the acquisition was announced this spring, reports emerged that the carriers would face opposition from the FCC. "There's no way the chairman's office rubber-stamps this transaction. It will be a steep climb to say the least," an agency official told The Wall Street Journal off the record. AT&T now appears to be preparing for the worst. The company announced last week that it will take a $4 billion charge this quarter in case it has to pay fees to Deutsche Telekom should the deal fall through. AT&T is said to have agreed to a $3 billion break-up fee and the possible forfeiture of "several billion dollars" worth of wireless spectrum allotments.